The just-released new book takes a critical look at the issues and proposes measures Catholics can take to remain faithful to the traditional teachings of the Church. YORK, Penn. (Sept. 26, 2018) An important new book has just been released to help Catholics better understand and oppose the radical and confusing changes of the Pope Francis era. Pope Francis’s “Paradigm Shift”: Continuity or Rupture in the Mission of the Church? An Assessment of His Pontificate’s First Five Years takes a critical look at the issues and proposes measures Catholics can take to remain faithful to the traditional teachings of the Church. The author, José Antonio Ureta, is an influential pro-life and pro-family activist, writer and speaker. His writings on Church and modern society have appeared worldwide. He presently serves as a senior researcher for the French Society for the Defense of Tradition, Family and Property (TFP). Using the Popes’ own words or those of his close associates, Mr. Ureta provides a clear doctrinal assessment of the Francis pontificate. He breaks away from the media hype clouding the issues and provides elements for readers to understand the radical changes being presented. The just-translated work spotlights most of the major controversies inside the Church. Some of the topics broached include Marxism, environmentalism, relativism, and fundamental morality. The debate on the apostolic exhortation, Amoris Laetitia is especially highlighted given the confusion about Communion for the divorced and civilly remarried. The book also asserts the right of the faithful to resist, not revolt against, the teachings contrary to those of the Supreme Magisterium of the Catholic Church. The English edition of the book was translated by José A. Schelini and published by the American Society for the Defense of Tradition, Family and Property (TFP). The e-book edition has now been released, and the print edition will be available on October 24. 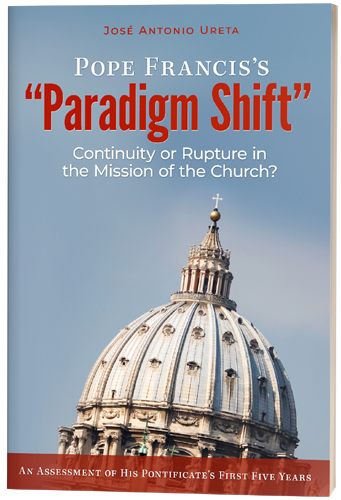 Those interested in reading or downloading the e-book version of Pope Francis’s “Paradigm Shift” can do so on the American TFP web site, at www.TFP.org/ParadigmShift. For more information about Pope Francis’s “Paradigm Shift” (Spring Grove, Penn. : The American Society for the Defense of Tradition, Family and Property, 2018; paperback ISBN: 978-1-877905-56-8; e-book ISBN: 978-1-877905-57-5; 210 pp. ), please e-mail tfp@TFP.org. This entry was posted in Catholic Perspective, Events of 2018 and tagged assessment, Catholic Church, Family, marriage, moral crisis, morality, Paradigm Shift, Pope Francis, Pope Francis’s “Paradigm Shift”, pro-family, pro-life, radical change, Tradition, traditional teaching by TFP.org. Bookmark the permalink.